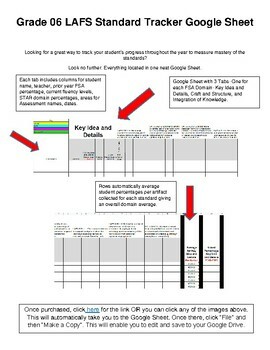 Looking for a great way to track your student's progress throughout the year to measure mastery of the standards? Look no further. Everything located in one neat Google Sheet. Each tab includes columns for student name, teacher, prior year FSA percentage, current fluency levels, STAR domain percentages, areas for Assessment names, dates. Rows automatically average student percentages per artifact collected for each standard giving an overall domain average.